‘FWENDLY FWUIT: WINTER WONDERS’ Is A Lovely Kid-Friendly Adventure — HEY, KIDS! COMICS! By Stefania Rudd. It’s Wonder Day. Strawberry and Banana are exited to spend the day with each other playing with their new toys. 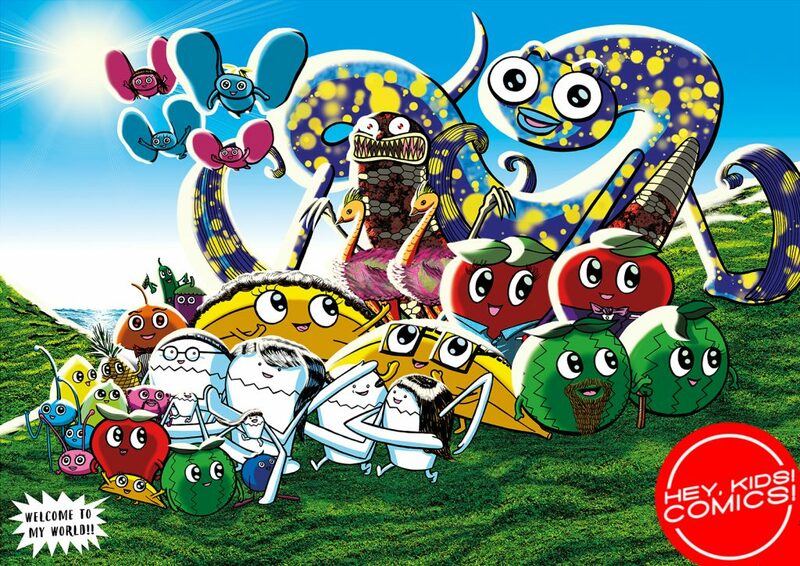 What’s a “Wonder Day?” Think of a version of Christmas in an alternate world, where anthropomorphic fruit and alien-like creatures live their lives just like you and me. Gifts and sharing. Friends and wonder. In writer and artist Mickey Lam’s new book, Fwendly Fwuit: Winter Wonders, the holidays have come early, and there is a missing friend to be found. Although this book is all-ages, it’s clear Fwendly Fwuit is aimed at younger kids. (The title’s a dead giveaway, right?) Lam’s writing is very simple in sentence structure and the words are easy to read. Also, certain characters, like Strawberry and Banana, speak in cutesy baby speak (“Rs” are written as “Ws”) to give a feeling that they have just mastered the ability to speak. (Hence, the title.) The main characters are also children themselves — they live with their parents, and most of their responsibilities include “having fun.” But when egg-shaped Kuppy asks for help to find his missing friend, Bowely, the fwuits, er, fruits assemble a team and go searching. Through teamwork, communication and friendship, they find Bowely and return her to the arms of her loving parents. Lam’s artwork is very colorful and uses a very cartoonish style. I could envision this as an animated series, with its big, big eyes and disrinctly adorable features. The coloring Lam gives some of these characters, like certain blue and yellow creatures and the weird sand worm things they encounter in the desert, have a tie-dye effect to them that are wonderful to stare at. (It makes me wonder how Lam accomplished the look.) Lam keeps the book consistently enjoyable and coherent for younger kids; it’s laid out in large panels and some of the action is spread across vividly colored full-page spreads. Fwendly Fwuit: Winter Wonders is a good book for those 10 years and younger, but I don’t think it’s something an adult would casually pick up and read without finding it too child-like. But, to be fair, it isn’t really meant for you, Pops. It’s a unique book coming from an independent publisher, one that provides a certain sweetness and heart that should be featured in comic book for children. And I can certainly appreciate that. ‘Fwendly Fwuit’ is available to buy here.